The Family Leave Insurance is a family leave law poster by the New Jersey Department Of Labor and Workforce Development. This is a mandatory posting for all employers in New Jersey, and businesses who fail to comply may be subject to fines or sanctions. This poster must be posted in a conspicuous place where all employees will see it. This poster describes instances when an employee can have paid leave from work for up to six (6) weeks including bonding with a child during the first 12 months after the child's birth or caring for a family member. This poster describes who is eligible for this plan as well as who is paying for the insurance. It appears you don't have a PDF plugin for this browser. 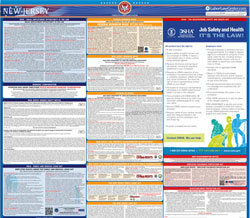 Please see the link below to download new-jersey-fli-poster.pdf. Family Leave Insurance provisions of the New  Jersey Temporary Disability Benefits Law. after the placement of the child for  adoption with the covered individual. 12 month period beginning with the first date of the claim. mail the employee information on how to file  a claim for Family Leave Insurance benefits to bond with the newborn child. disability claim and no waiting period will be required. employees covered under the private plan. benefits is the same as the taxable wage base for Unem ployment and Temporary Disability Insurance. contact this department thr ough New Jersey Relay: 7-1-1.